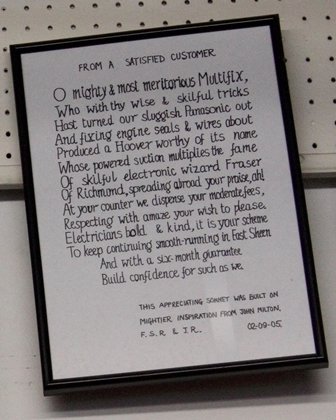 Multifix started life over 40 years ago as part of Frasers of Richmond, until the present owner John Clifton took over the Sheen shop and re-named it as Multifix. He handles all the home calls, repairing washing machines, dishwashers, fridges, ovens, and most white goods too heavy to move. Jeannette looks after the shop with two repairers who work on smaller items which are brought in like vacuum cleaners, irons, toasters, lights which need re-wiring, and many other things. The premises on Upper Richmond Road have an old-fashioned look and are usually choc-a-bloc with repaired items waiting to be collected, boxes piled on the floor, and new goods for sale scattered around. Replacement vacuum cleaner bags are clearly an important part of Multifix’s sales and they cover an entire wall of the shop. There are hundreds of different bags on the market and Jeannette is skilled at solving the headache of finding the right bag for a customer’s machine. 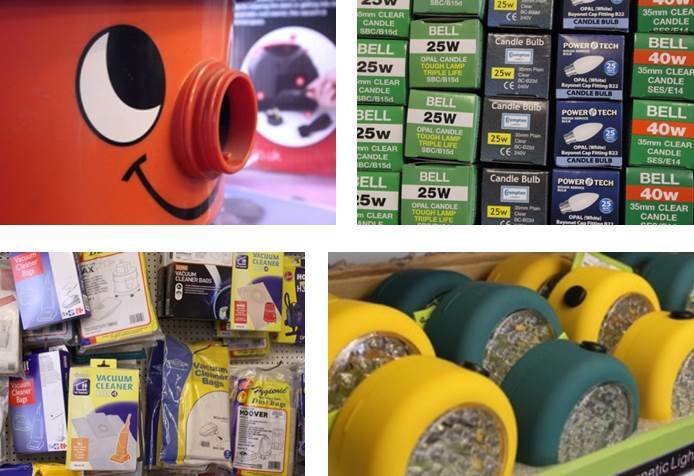 Multifix also stocks a huge number of electric light bulbs, including the new LED bulbs which don’t get hot and have no mercury in them but are expensive at £8.90 each. It’s no wonder the shop won Best Trader awards in 2003 and 2005 from the Mortlake and East Sheen Society in a scheme which is now unfortunately discontinued. But repairing and servicing vacuum cleaners is probably the bulk of the shop’s business. Ralph can even repair the old Hoover Junior, the ancient upright model first sold in 1935, which amazingly is still in use in some Sheen homes.